This gorgeous home in Flagstaff Ranch was designed using Medallion Cabinetry's Sonoma door with an Eagle Rock finish. We are working hard to get you photos of all the jobs we are doing this spring. On many occasions we are waiting to get the photos until AFTER counters and appliances are installed. Keep checking our Gallery pages for more updates. A humble abode tucked away in the outskirts of Flagstaff is where you’ll find this cozy Kitchen. Although the client had a small space to fit all her appliances, we arranged them in an effective manner to ensure an efficient flow in the kitchen. The small but mighty island helps break up the space, offering space for children, family or friends to relax while still being apart of the hustle and bustle. Many large drawers and roll outs fill this space to optimize storage. Upper cabinet shelving smooths the end of each run towards the windows and without crowding the sink area, offers even more storage. The knotty wood and medium stain brings a natural and homey element into the space. In contrast, a more decorative door style still provides décor. Granite tops tie every element together in this perfect home for two. This family-of-four kitchen includes everything needed to keep each day running smoothly. From trash/recycle units, to pull out spice racks and even new pantry amenities, this medium sized kitchen has got it all. We modified the footprint to enlarge the sink wall run and make the entire space feel larger without encroaching into, and overpowering, the dining room. Furthermore, the uniquely shaped space under the stairs, which was previously converted into a pantry, is now even more functional with finished shelves and alternating height bookcases to accommodate the sloped ceiling. 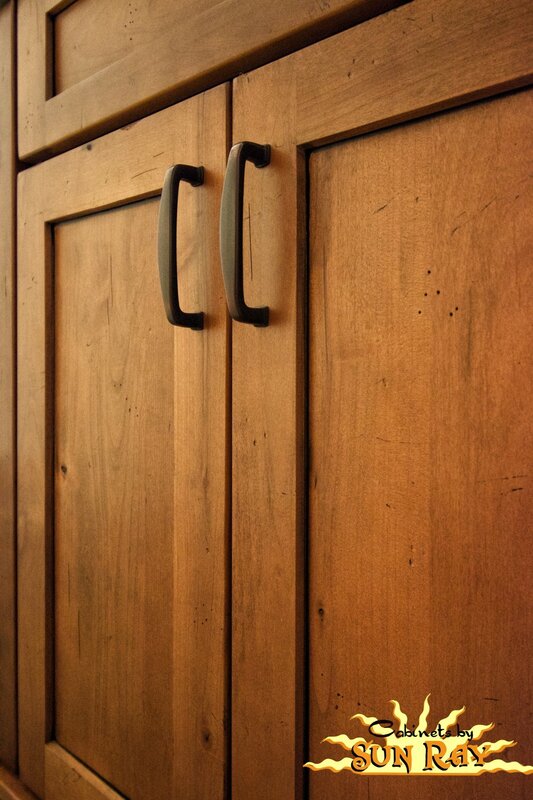 The warmth of Medallion Cabinetry’s Rumberry stain, paired with a twist on a traditional shaker door, fits right into the surroundings of Northern Arizona.